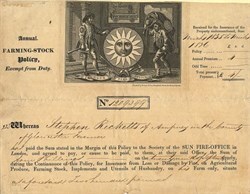 Beautiful Annual Farming Stock Policy from the Sun Fire Office issued in 1835. This historic document has a vignette of two firefighters, a fire engine, other fire fighting equipment and the Sun badge or firemark. The policy was issued to Stephen Ricketts of Ampney in the County of Glouester and covered such loss or damage by fire on Agricultural Produce, Farming Stock, Implements and Utensils of Husbandry. This item is over 164 years old. 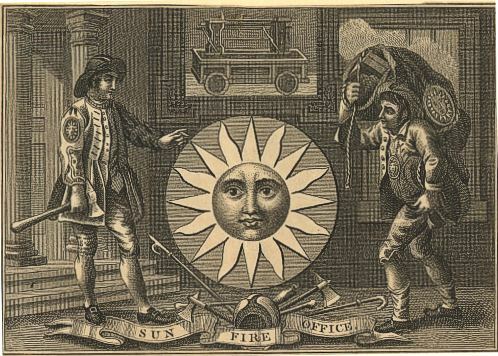 This company was commonly called The Sun Fire Office. It was founded in 1710 in England and was active for 250 years until 1960. The sun badge or firemark pictured in the center of the sign can still be seen affixed to old houses throughout England. In the 18th and 19th Centuries Sun Insurance companies would not put out a fire if there was no insurance or fire mark, such as the one pictured on this sign, displayed on the outside of a house.